If you have been looking for an easy-to-use hydraulic hot tub cover lifter that one person can remove and replace with ease, The Cover Guy Hydraulic Cover Lifter is what you need. Our hydraulic cover lifter is our bestselling lifter. It will provide years of reliable and maintenance-free service. Plus, it’s easy to install, and easy to use! The hydraulic lifter fits any hot tub. You can use it as a high side mount or top mount hydraulic cover lifter. In either installation, it makes it easy for one person to lift off your hot tub cover. The hydraulic lifter system is made from large-diameter aircraft aluminum tube which eliminates twisting and torque. The corrosion-resistant gas shocks provide extra lift assistance, making it simple for one person to remove the spa cover from outside or inside the hot tub with minimal effort. The Cover Guy hydraulic cover lifter requires very little clearance behind your hot tub. 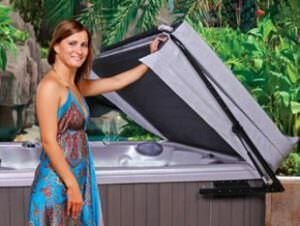 You will need no more than the depth of your folded hot tub spa cover. Also, you can attach the lifter directly to the floor or deck surface if your hot tub or spa is set into your deck. The lifter is easy to assemble using only a drill, screwdriver and wrench; instructions and toll-free customer service provided.